The RJ45C5 T1D 3.2N4N TY connector from the Weidmüller Omnimate data range, offers a connector system with an eight-pole miniature plug-in system for use in connections with STP and UTP cables. This RJ45 jack by Weidmüller features an outgoing elbow of 90° with an extended temperature range of −40°C to +85°C and a solder pin length of 3.2mm.RJ45 jackMounting onto PCB via through-hole (THT) solder connectionPitch of 1.27mm .. The RJ45C5 T1V 3.2N4N TY connector from the Weidmüller Omnimate data range, offers a connector system with an eight-pole miniature plug-in system for use in connections with STP and UTP cables. This Weidmüller RJ45 jack features an outgoing elbow of 180° with an extended temperature range of −40°C to +85°C and a solder pin length of 3.2mm.RJ45 jackMounting onto PCB via through-hole (THT) solder connectionPitch of 1.27mm.. The RJ45C6 T1U 2.7N4N TY series from the Weidmüller Omnimate data range, are a plug-in connector system with an eight-pole miniature plug-in system for use in connections with STP and UTP cables. This Weidmüller RJ45 jack features an outgoing elbow of 90° with an extended temperature range of −40°C to +85°C and a solder pin length of 3.2mm.RJ45 jackMounting onto PCB via through-hole (THT) solder connectionPitch of 1.27mm .. The RJ45C6 T1V 3.8N4N TY connector from the Weidmüller Omnimate data range, offers a connector system with an eight-pole miniature plug-in system for use in connections with STP and UTP cables. 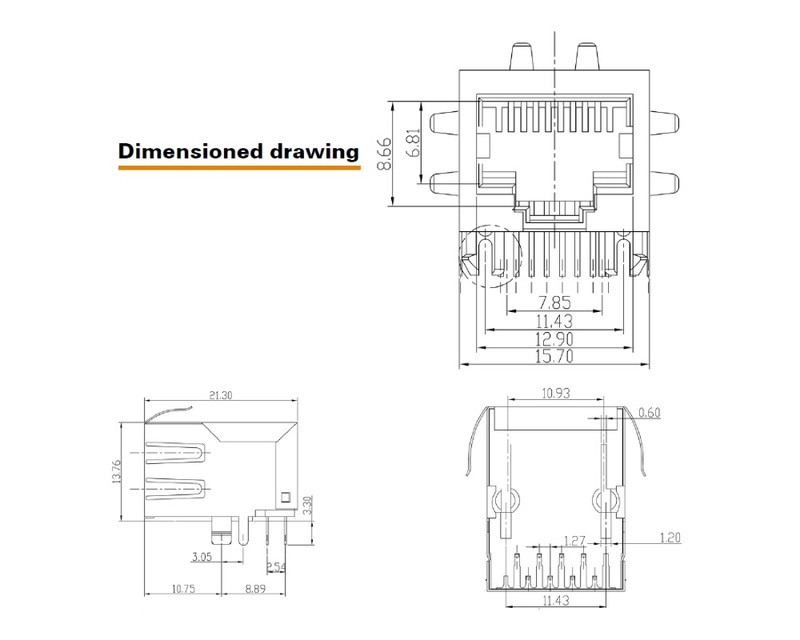 This Weidmüller RJ45 jack features an outgoing elbow of 180° with an extended temperature range of −40°C to +85°C and a solder pin length of 3.2mm.RJ45 jackMounting onto PCB via through-hole (THT) solder connectionPitch of 1.27mm.. The RJ45C5 T1U 2.8N4N TY connector from the Weidmüller Omnimate data range, offers a connector system with an eight-pole miniature plug-in system for use in connections with STP and UTP cables. This Weidmüller RJ45 jack features an outgoing elbow of 90° with an extended temperature range of −40°C to +85°C and a solder pin length of 3.2mm.RJ45 jackMounting onto PCB via through-hole (THT) solder connectionPitch of 1.27mm.. The RJ45C5 T1V 4.0N4N TY connector from the Weidmüller Omnimate data range, offers a connector system with an eight-pole miniature plug-in system for use in connections with STP and UTP cables. This Weidmüller RJ45 jack features an outgoing elbow of 180° with an extended temperature range of −40°C to +85°C and a solder pin length of 4mm.RJ45 jackMounting onto PCB via through-hole (THT) solder connectionPitch of 1.27mm.. The RJ45C5 R1V 3.2N4G/Y TY connector from the Weidmüller Omnimate data range, offers a connector system with an eight-pole miniature plug-in system for use in connections with STP and UTP cables. 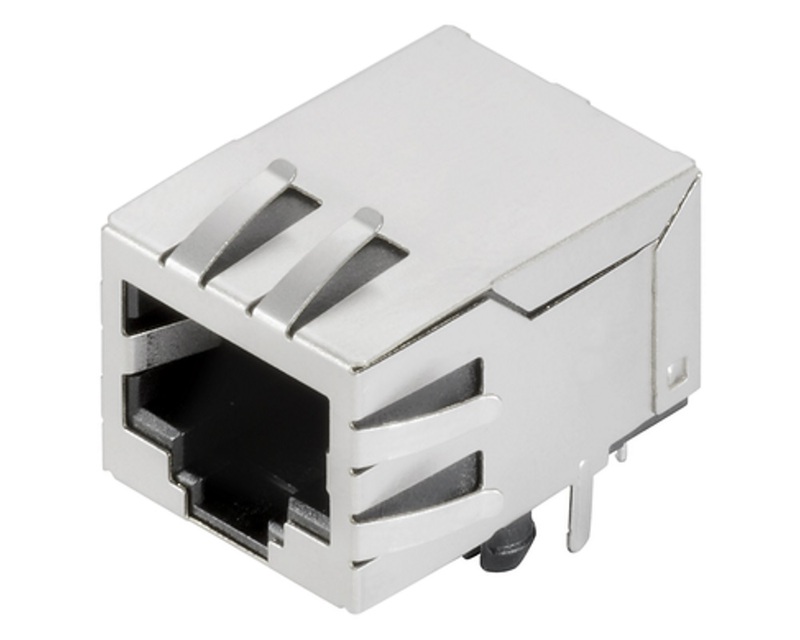 This Weidmüller RJ45 jack features an outgoing elbow of 180° with an extended temperature range of −40°C to +85°C and a solder pin length of 3.2mm.RJ45 jackMounting onto PCB via through-hole (THT) solder connectionPitch of 1.27mm .. The RJ45C5 T1D 3.2E4G/Y TY connector from the Weidmüller Omnimate data range, offers a connector system with a twelve-pole miniature plug-in system for use in connections with STP and UTP cables. This Weidmüller RJ45 jack features an outgoing elbow of 90° with an extended temperature range of −40°C to +85°C and a solder pin length of 3.2mm.RJ45 JackMounting onto PCB via through hole(THT) solder connectionPitch of 1.27mm.. The RJ45C5 T1U 2.8E4G/Y TY connector from the Weidmüller Omnimate data range, offers a connector system with a twelve-pole miniature plug-in system for use in connections with STP and UTP cables. This Weidmüller RJ45 jack features an outgoing elbow of 90° with an extended temperature range of −40°C to +85°C and a solder pin length of 2.75mm.RJ45 jackMounting onto PCB via through-hole (THT) solder connectionPitch of 1.27mm .. The RJ45C5 T1D 3.3E4N TY connector from the Weidmüller Omnimate data range, offers a plug-in connector system with an eight-pole miniature plug-in system for use in connections with STP and UTP cables. This RJ45 jack features an outgoing elbow of 90° with an extended temperature range of −40°C to +85°C and a solder pin length of 3.3mm.RJ45 jackMounting onto PCB via through-hole (THT) solder connectionPitch of 1.27mmOutg.. The RJ45C5 T1U 2.8E4N TY connector from the Weidmüller Omnimate data range, offers a connector system with an eight-pole miniature plug-in system for use in connections with STP and UTP cables. This Weidmüller RJ45 jack features an outgoing elbow of 90° with an extended temperature range of −40°C to +85°C and a solder pin length of 2.75mm.RJ45 jackMounting onto PCB via through-hole (THT) solder connectionPitch of 1.27mm.. The RJ45C5 T1V 3.2N4G/Y TY connector from the Weidmüller Omnimate data range, offers a connector system with a twelve-pole miniature plug-in system for use in connections with STP and UTP cables. 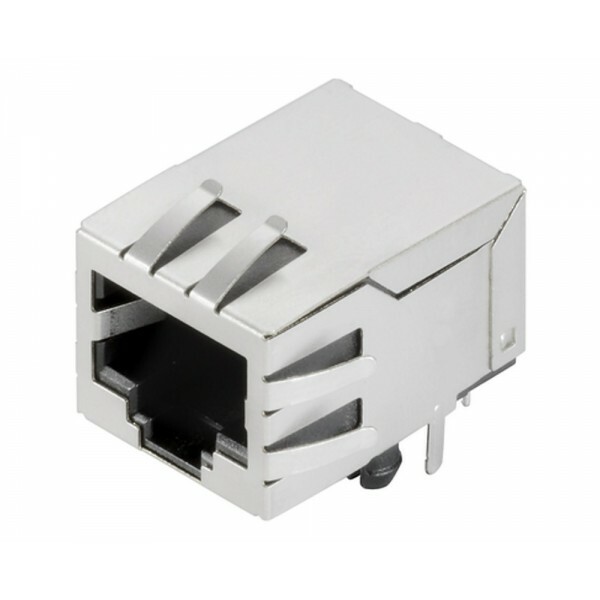 This Weidmüller RJ45 jack features an outgoing elbow of 180° with an extended temperature range of −40°C to +85°C and a solder pin length of 3.2mm.RJ45 jackMounting onto PCB via through-hole (THT) solder connectionPitch of 1.27mm ..